DO YOU KNOW WHAT YOUR UNITED WAY DONATION LOOKS LIKE? Nolan was born a perfectly healthy child. But when Nolan was 18-months old things changed. His interaction – babbling, eye contact, facial expressions, and gestures – stopped or was drastically different. Just before Nolan turned 2, he was diagnosed with autism. “The doctors told me that he might never speak, and he would never live a life of his own,” said Allison, Nolan’s mother. His parents never gave up hope. 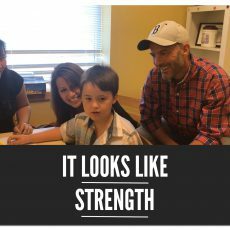 After trying a variety of strategies, when Nolan was 3, his preschool program introduced him to Melissa, a therapist from Northeast Hearing & Speech. Melissa used a variety of techniques to work with Nolan, but because progress was slow, she suggested an alternative communication device. “This was a difficult decision for us,” said Allison. “As a parent, you want to hear your child’s voice. We were worried that he’d become dependent on the device and never want to talk.” Allison and Jason decided to trust the advice and give it a try. Today, Nolan has found his voice. Not only is he forming words and sentences, his personality has blossomed, he effectively communicates his emotions, and he is ready to learn with his peers. Do you know what your United Way donation looks like? It looks like strength. It looks like kids getting a strong start. Northeast Hearing & Speech is a funded community partner of United Way of Greater Portland working to advance Thrive2027 Goal 1 (Give kids a strong start) by identifying and treating developmental delays early so that kids enter Kindergarten ready to learn.